MEDIA: "Latino Artists Speak on War"
MEDIA: "Politics and Art Merge at LACMA- Museum Event Features Latino Artists Exploring Cultural Issues, Problems"
MEDIA: "Books to Focus on Latino artists"
This month the CSRC launches a new book series on individual Latino and Latina artists, and we also begin two public programs as part of our agreement with the Los Angeles County Museum of Art. 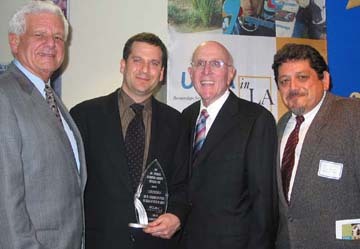 The Ann C. Rosenfield Community Partnership Prize was presented to Chon A. Noriega by UCLA Chancellor Albert Carnesale at a reception hosted by the UCLA Center for Community Partnerships on January 27, 2005. MEDIA: "Homogenous Faculty a Pressing Problem"
"Although discussions on diversity have concentrated on the lack of a diversity requirement and the continued decline of students of color attending the University of California’s two flagship campuses, one major component of a diverse campus climate has gone unnoticed, or rather ignored: the lack of faculty diversity." In the 1960s, I would ponder reaching the next millennium, when I would be an unthinkable age, older even than my parents.